Galway City Council have this evening granted planning permission for a new two acre development which will deliver in excess of 26,000 sq. m of Grade A Office Space to Galway City Centre. 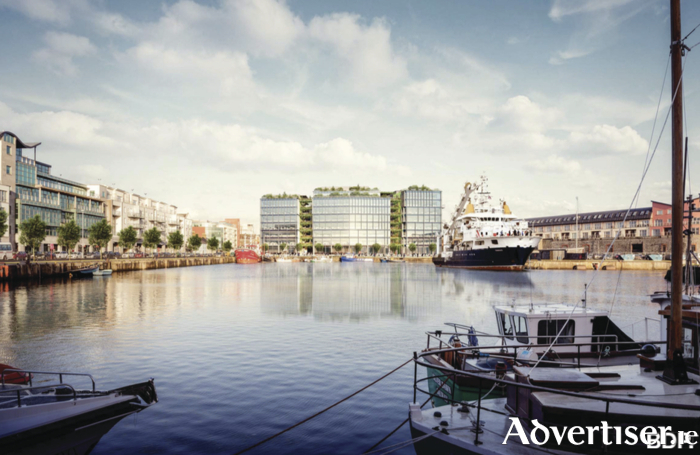 The development by Edward Capital, which is located in Galway City Centre overlooking Galway Docks, will be known as BONHAM QUAY and when completed will provide will provide in excess of 26,000 sq. m of Grade A Office Space. The four blocks range in size from 4,820 to 11,845 sq. m, designed with maximum flexibility to allow multiple occupation while maintaining an extremely efficient gross to net ratio that does not compromise efficiency for single occupancy. In addition, the scheme has been revised substantially and can now fulfil a variety of uses. The public realm use has been reconfigured to ensure permeability with the existing city centre and its historic street pattern. In addition the 3,700 square metres of these new public squares and plazas have been designed to be multifunctional and adaptable. They can be used for impromptu and organised events such as pup up markets, performances and outdoor cinema screenings. The most significant revision will be the provision of a larger dedicated arts/cultural facility. This multipurpose space will be a highly visible and flexible space for the use of corporate clients and the city of Galway alike. The space will be made available to local community partners and arts groups. A significant design feature will be the option to incorporation of sliding doors and walls which will open out to and to provide a significant connection with the Docks and Galway Bay beyond. “It will cement a reimagining of Galway as it moves toward 2020 and takes up the mantle of European Capital of Culture. It will make up for a dearth in city centre office space that has precluded major international occupiers of moving operations to the city. It will have a major positive impact on tourism, local entertainment and hospitality offerings. The addition of the multipurpose auditorium and improvements to the public realm will be of great advantage to the local community. “Bonham Quay will offer significant opportunities for Galway and it’s surrounding areas post Brexit with ease of access to both Dublin and Shannon Airports. The reaction from the market has been very encouraging and we have already had strong interest from UK based firms wishing to relocate to cities like Galway. The quality of lifestyle in Galway is also sure to be a huge attraction for foreign direct investment and their employees. Edward Capital has retained as architects BDP, the major international architect-led design practice, who continue to design and deliver many major workplace schemes across Ireland, the UK and internationally for clients such as Google. In Bonham Quay, BDP have provided a scheme of 26,000 sq. m. of new Grade A office space for Galway and 2,005 sq. m. of retail and restaurant space. In the scheme as envisaged, BDP have created holistic workplaces and developed innovative solutions that lowers its environmental impact. Bonham Quay is projected to cost €104m to construct in total. Bonham Quay is designed to the highest standard with all modern specifications, maximising the use of external glazing along with high-level landscaped areas through the scheme to allow the buildings take full advantage of the aspect of the site with spectacular views over Galway Docks and Galway Bay. Edward Capital will its considerable experience in mixed-use urban regeneration and provide a new urban quarter that will showcase the best of Galway. These blocks will be designed around a new public area and landscaped grounds. Edward Capital has appointed Cushman & Wakefield to ensure BONHAM QUAY is aggressively marketed both nationally and internationally. There is no new office space in the pipeline in the city centre and there is the lack of supply of modern floor plate offices that are flexible enough to cater for sophisticated multinational occupiers. The delivery of BONHAM QUAY will seek to remedy this situation. News of the go-ahead was welcomed by Cllr Michael Crowe who is one of this project’s most vocal supporters. “This is one of the most important decisions in recent times for Galway City,” he said. adding that it is an enormously positive day for Galway and the West of Ireland. “It will be a very attractive location for both foreign direct investment and indigenous businesses. I have believed that this part of the City needs an upgrade for many years. “At the moment there is no significant office space available in Galway and more and more around the world, firms want to locate in the city centre. He said that it is fair to say that this project has attracted some opponents but he hopes that the decision will not be appealed, adding that talks can take place to allay any concerns held by any parties. “Those who that made a submission will be entitled to appeal this decision to grant, to An Bord Pleanala. I would respectfully request these parties not to do this. “I contend that talks can be had to alleviate some of these concerns. To appeal this, is not in the best interests of our city or more importantly, all of the people that live in this part of the country,” he concluded.